It should come as no surprise that I, Gladiator opens with death. The main character, Rufus’ death to be exact. See, Rufus is a (drumroll) gladiator, and a renounced one at that. At least, he was, until a gladiator he was trying to offer mercy to literally stabbed him in the back. Now contemplating his incoming eternal torment as he rides down the mythical river Styx, the scene cuts to Mercury and Pluto (not the planets) chatting it up. Turns out Mercury needs a gladiatorial champion, and he’s keen to scoop up the recently deceased Rufus to do the deed. It doesn’t take much convincing for Rufus to agree to fight for Mercury, and sooner than you can say “clichéd plot”, Rufus is back, and ready to fight again. He’s starting from scratch, though, and has to work his way up the Gladiatorial ladder to get to the Coliseum again. So here begins our epic tale of finger swiping, but will it be truly epic, or will it fall on its sword? The whole game takes place in the arena, and although the surroundings may change, the basic mechanics stay the same. You control Rufus, and have to clear out increasingly difficult arenas by fighting your way through the other gladiators within. This is mainly accomplished by using Infinity-Blade-esque swordplay, in third person. The sword controls (your sword swings like your finger swipes) are a little slippery at times, but it’s the lack of a combo system that really breaks the swordplay overall. You can basically just swipe back and forth, kick, then powerswipe each enemy, which really takes out the strategy of the game. However, the lack of strategy is compensated for by the combat system being plain fun. You will participate in this gameplay through two modes, Story and Tournament (A mysterious multiplayer mode lies grayed out within Tournament, and whether or not it needs to be unlocked, or if it’s coming in a future update, I don’t know). There’s not really a huge distinction between the two modes, and the overarching rewards in each seem to be the same. You’ll be asked to complete objectives in each level, (such as eliminating enough enemies with traps, or not losing a certain amount of health) upon completion of which you’ll receive a skill point for an RPG-like skill tree. A level-up system in-game also nets you XP towards more skill points, which you can spend to upgrade Rufus’ various attributes like defense and health. The final mechanic in the overarching structure of the game is the weapons system. You can buy light weapons, like swords, you can carry double weapons (two swords), or you can have a heavy weapon, like a nice, spiky mace. Each weapon, of course, has their own benefits and disadvantages, and they all handle differently enough to encourage experimentation. Hmm…this actually sounds a lot like Infinity Blade. 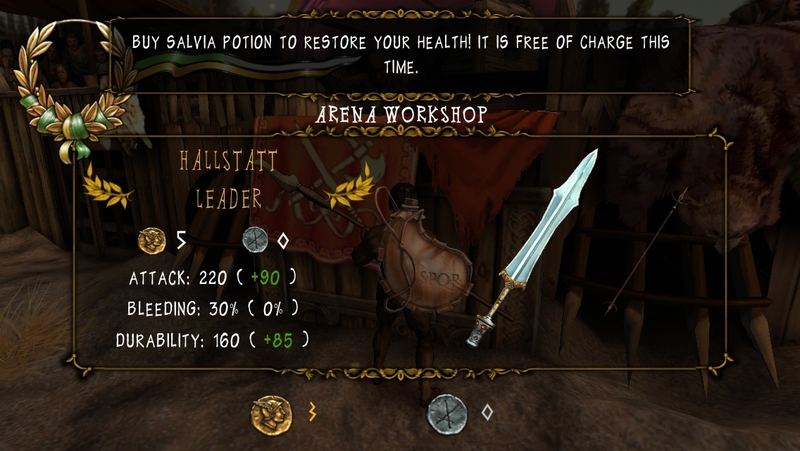 There are some other neat features in the arena, like being able to pick up weapons dropped by enemies, having to keep your own weapon from being broken, and being given the opportunity to use various traps throughout the battlefields against your opponents. All of these extra mechanics are certainly cool, and they do have moments when they work well. However, there are a couple fallacies here. First of all, the traps, while effective and just plain awesome, are far too inconveniently placed to be of much use. Their weak propitiation throughout the arenas more often than not means you’ll have to spend extra effort to lure an opponent to one. It’s during those times that you realize it’s probably easier to just finish them off yourself. Secondly, the chance that your weapon will break seems to add strategy on the surface, but since the developers decided to permeate the game with in-app-purchases (more on that in a second), to me, it just seems like a move on your wallet. 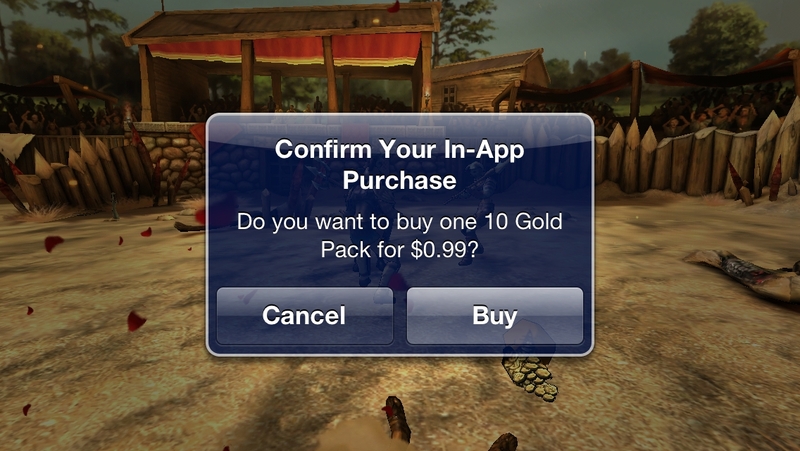 By far the biggest problem with I, Gladiator, though, is the lust the game has towards player’s wallets. 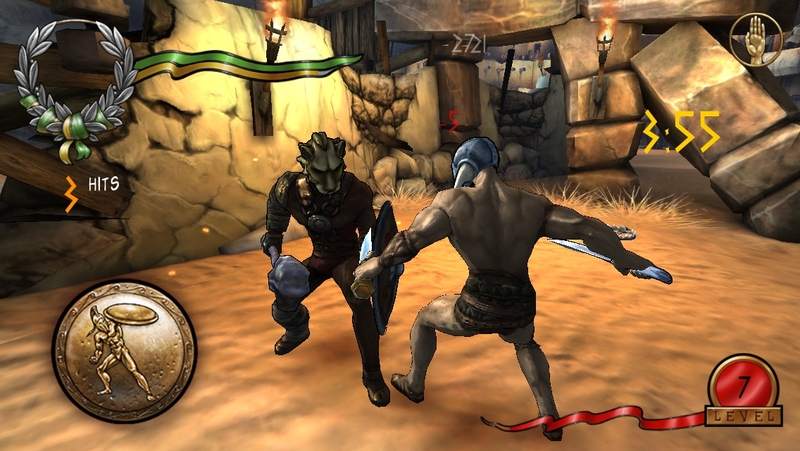 It shows through far too often in the gameplay, with in-app-purchases available for weapons, and other gear, more skill points for the player’s skill tree, and even health during bouts in the arena. Not only are these purchasable unlocks pointless, the sheer amount of them makes them irritating. Looking at the game’s art style, it’s obvious where comparisons to console game Borderlands come in. The stylized textures, although a bit derivative, are snappy looking, and the environments look equally impressive. The complementary sound design clicks well into place with the theme, giving your ears a taste of the arena, with a roaring crowd and the grunts of the fighters within. If nothing else, I, Gladiator is a very pretty game. Get past the quite incessant moves on your credit card, and you’ll find a very good game here. There still are problems, sure, like the sometimes weak combat, and the implementation of arena traps. But frankly, the game is still very playable, and has its moments of excellent fun. In short, yes. It is worth suiting up for. ← Sonic Dash : Gorgeous and Greedy? Does SEGA Ask For Too Much?